Invite your guests to play to win with this casino inspired invitation. 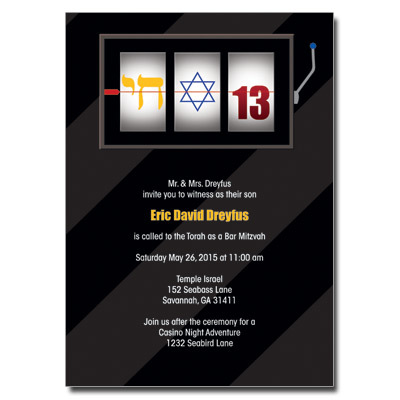 This invitation is designed with a black and grey diagonally striped background complete with a slot machine featuring the classic symbols of a Bar Mitzvah. Your event information is printed in white with your child's name printed in a vibrant yellow. Card measures 5 x 7.